As public purse strings tighten and municipal operating budgets freeze or even shrink, solid waste collection fleets are expected to deliver more value per dollar than ever before. Indeed, the near-constant pressures felt by waste fleet managers—including improving efficiency, lowering costs, going greener and operating more safely—are only increasing. Enter the smart fleet. Smart fleets improve operational efficiencies and environmental impact, save money and even improve safety through the use of the smart truck—a truck with a brain. Smart trucks use onboard computing (OBC) and camera systems to collect engine control module (ECM), GPS data and other sensor data during vehicle operations in real-time and communicate it to back office systems. This helps optimize routing, reduce maintenance costs and the environmental footprint1, improve operational performance and safety, and provide complete visibility into truck and driver behavior. Not only that, but these improvements can also be measured: Research has shown that smart trucks can help fleets slash up to 30 minutes per truck from daily routes.2 For fleet managers responsible for 10 routes, that means a savings of more than $100,000 per year. For managers with up to 150 routes, it equals a cost savings of more than $6,000 per day or $1.7M per year. But we all know that change, even for the better, can sometimes be difficult. It requires proactivity. It can be disruptive. Change also usually costs money, at least upfront. So how ready and willing are fleet managers to adopt new technologies and improve efficiencies, both now and in the near future? Overall, waste fleet managers indicated that they are more than ready for the adoption and implementation of OBC, GPS, video recording and other technology systems. But as the results above show, some respondents also face barriers that prevent their organizations from becoming truly smart, efficient and cost effective. Question 1: How Do You See Your Business/Fleet Operations Changing in the Next Five Years? 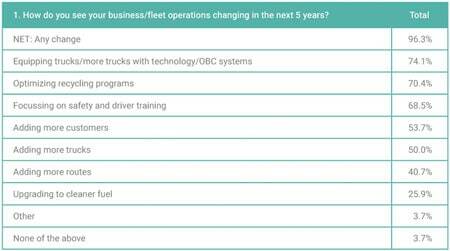 Of all respondents surveyed, more than 95 percent indicated that they believe their business or fleet operations will change within the next five years, and nearly 75 percent indicated that their goal is to equip trucks with more technology and OBC systems (see Table 1). That means nearly three-quarters of fleet managers are already so convinced of the importance of technology in improving efficiencies and lowering costs that they are already planning on adding some kind of OBC system within the next few years. This should not be surprising: OBC systems capture and store vehicular data for accurate performance reporting and alerts to stakeholders, providing complete and real-time visibility into route progress. But this question only tells half the story. To dive deeper into where fleet managers expect their business and fleet operations to go, we need to look at what kind of technology they have already implemented or expect to implement and why. Question 2: What Technology Investments Are You Planning in the Next 12 to 18 Months? Question 3: What Are the Most Exciting Technologies You Have Started to Work with in the Last 12 Months? 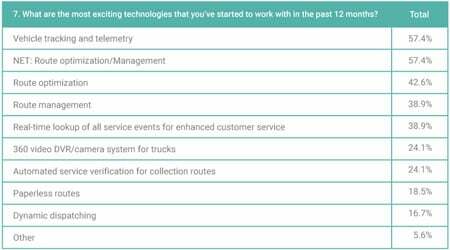 According to the survey, the different technologies that fleet managers hope to add in the future are varied: fleet and route management systems, GPS tracking systems, surveillance video recording systems and electronic logging devices (ELD) for compliance purposes each received more than 30 percent (see Table 2). This indicates that many fleet managers already recognize that there is not one single technology that makes a truck smart—rather, it is a combination of several systems working in tandem. That coincides with the broad range of technology investments many respondents indicated they had already made within the last 12 months (see Table 3). While vehicle tracking/telemetry and route optimization topped the list, several different technologies also had strong showings, including those that did not make the top five above, such as paperless routes (18.5 percent) and dynamic dispatching (16.7 percent). 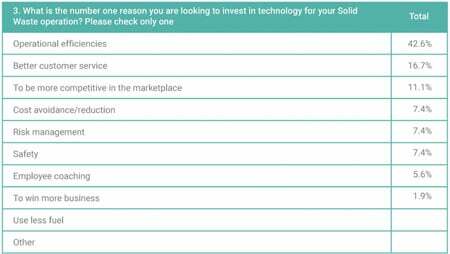 Question 4: What’s the #1 Reason You Are Looking to Invest in Technology for Your Solid Waste Operation? 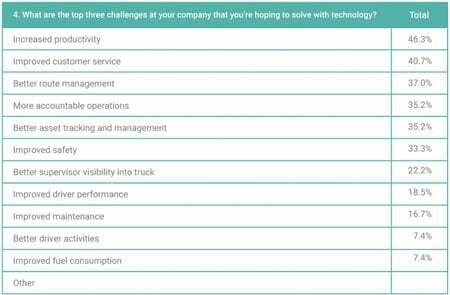 Question 5: What Are the Top Three Challenges at Your Company that You are Hoping to Solve with Technology? Question 6: How Does Your Organization Respond to or View New Technology Initiatives? Despite the broad range of technologies being looked at or engaged by fleet managers, when it comes to reasons for investment and when asked to name a single factor there was only one main choice: improving operational efficiencies (see Table 4). This motivating factor trumped all others in the survey, including improving customer service and increasing competitiveness. Indeed, improving efficiencies (42.6 percent) received nearly 30 percent more support than the next closest option. That is probably not surprising, considering the efficiency-driven environments of most municipalities and local governments today. It is clear that, while improving customer service is important—and according to Table 5, it is one of the top three challenges fleet managers hope to solve with new technology—when it comes right down to it, the pressures most fleet managers are feeling are on the efficiency side. Which is why it is also probably not surprising that, on average, fleet managers are very open to new technologies (see Table 6): more than 80 percent of respondents indicated varying levels of openness to new technology, ranging from very open to cautiously optimistic, with just 7.4 percent indicating that they are initially skeptical of new innovations. So far we have seen that waste fleet managers expect—and are for the most part embracing—a move toward smart fleet management tools within their operations. We have also seen that they are interested in a broad range of technology upgrades in order to improve efficiencies and save money, from vehicle tracking and telemetry to GPS and surveillance video. However, as in many businesses, those in solid waste management face serious challenges across the industry when it comes to implementing this desired change. At the top of the list? Budget constraints and internal resistance to new technology. Question 7: What (if Any) Factors are Preventing You from Acquiring New Fleet Management Technologies? Question 8: What Tools Would Help You the Most in Your Efforts to Acquire Funding for Your Technology Initiatives? Of all respondents surveyed, 81 percent said that they face some kind of barrier preventing them from acquiring new fleet management technologies—a significant percentage. As Table 7, shows, costs and budget issues (44.4 percent) are by far the #1 reason why more fleet managers are not adding even more technology to their operations. It is clear that even though most managers are aware of the significant cost savings and performance improvements that fleet management technology can bring, many still face an uphill battle when presenting these opportunities to senior leadership. That is partially because fleet managers do not necessarily have the ROI numbers in their back pockets to justify the initial expense. But plenty of research has already been done,3 proving the long-term value of smart fleets, with, as mentioned previously, the most advanced solutions helping waste fleets cut 30 minutes per truck from daily routes. A smart fleet’s RFID-enabled cart delivery and automated asset tracking also enables firms to capture missed revenues, improve processes and save money. Indeed, as more operators and clients of operators—from private companies to public institutions like local governments4—recognize and endorse the long-term value of smart fleets, the budget argument becomes easier to make from a long-term savings perspective. Fleet managers can also engage vendors in pilot projects5 that help deliver value and provide a proof of concept for senior leadership. Respondents indicated that these types of projects, along with customer references, ROI analyses and live demos are all helpful tools for acquiring funding for technology initiatives (see Table 8). But even if organizations do have the money to invest, other barriers can also stand in the way (see Table 9, 9A, below and page 44): internal culture and politics (45.5 percent) and past bad experiences with technology (43.2 percent) are the most prevalent, followed by internal resistance to change (34.1 percent). Question 9: What Are the Barriers to Get Funding for Any Technology Project You Want to Implement (of Those Respondents Who Indicated Barriers)? In this respect, fully embracing the concept of smart trucks and smart fleets likely involves something of a culture shift at your organization. Most companies are not inherently data driven: along with forcing longtime employees to use new tools and learn new systems, the use of real-time data can also shine a light on areas of the business that are not performing as well. Some of this internal resistance can also stem from a mistaken belief6 that fleet management systems are difficult to deploy. If done incorrectly, this can be true. However, by implementing a gradual, phased approach, you can alleviate any initial frustrations by proving the technology’s effectiveness as you roll it out across the organization. 1. Having a champion in the C-Suite: It is hard to effect real change without executive buy-in. That is why having at least one champion on the executive team can go a long way when pushing for fleet management upgrades. 2. Not forgetting the importance of training: Even the most effective program can lose steam quickly if employees do not know how to use the system. To get the most ROI from your investment, it is crucial to be proactive about training. 3. Constantly communicating: By highlighting and communicating small wins and the effectiveness of new technology across the company, you can help build and sustain momentum for even more technology projects and upgrades. 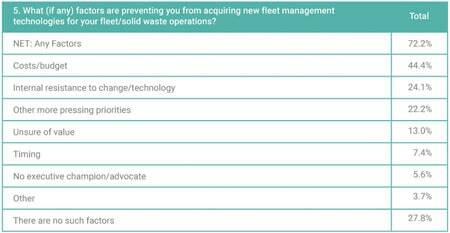 This solid waste fleet manager survey shows that many fleet managers are not just hungry for various types of new fleet management technologies, including OBC systems, vehicle tracking and telemetry, GPS, surveillance video and more, but in many cases, they have already implemented some of them. While managers name a range of motivating factors for investing or wanting to invest, including improved customer service, the desire for increased efficiency seems to be the most prevalent. However, many fleet managers also say that they either do not have the budget or the internal support necessary to implement all their desired technology projects. That means proving the business case of tech upgrades to senior management, including the use of pilot projects, proofs of concept, customer referrals and ROI analyses (see Table 10). Either way, it is clear that fleet managers recognize the power of smart fleets to transform their operations. Aside from the ROI considerations mentioned earlier, smart fleets also facilitate better customer service through automated service verification and real-time business intelligence analysis. They also improve safety through real-time driver visibility and reduce a fleet’s environmental footprint via route tracking and optimization.Fleet managers, by and large, are well aware of the value of these systems. Now it is time to convince the rest of the organization. A waste industry fleet management veteran, Don Diego Padilla II is Vice-President at FleetMind Solutions (Montreal, QC) where he spearheads business and customer development activities. Previously, he was a Regional Sales Director for Allied Waste, now a part of Republic Services, a leading provider of solid waste collection, transfer, recycling and disposal services in the US. Don Diego is a frequent contributor to FleetSMARTS, an industry newsletter targeted at fleet organization executives. He can be reached at dpadilla@fleetmind.com. 2. Survey conducted by Fleetmind.